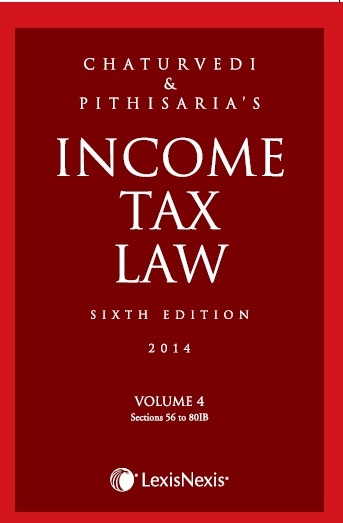 CHATURVEDI & PITHISARIA’S INCOME TAX LAW, Sixth Edition, 2014, a long awaited work, is being published after a gap of thirteen long years. Surpassing any comparable work, this evergreen classic encapsulates the law of income-tax in the most authentic and comprehensive manner. The work embodies logical and systematized analysis of the principles of income-tax law on one hand, while imparting practical guidance on the other. Various facets of law have been analyzed through illustrations with precision and clarity. The present edition is statutorily updated upto August 2014 including the Finance (No. 2) Act, 2014, and contains case law upto and including ITR 363, as well as select cases from other journals. Presented in a set of 10 volumes, this work covering over 85,000 judicial decisions is meticulously arranged under approximately 25,000 headings and sub-headings. More than 5,000 pages have been added in this new edition, covering nearly 12,000 additional judgments reported over the last thirteen years. All departmental circulars, notifications and press notes issued by the CBDT and the Ministry of Finance till the date of publication of each volume have been reproduced at appropriate places. In addition, relevant rules and forms and allied provisions have been furnished.